Chihuahuas are not a type of rodent bred to look like a dog. This is an urban legend that has been thoroughly debunked. The Chihuahua is the smallest dog breed in the world and the oldest breed in North America with its origins shrouded in mystery. The dog came into prominence about 100 years ago in Mexico but many believe the dog originally came from Egypt while others insist that the Chinese first bred the dog. Chihuahuas can live up to 15 years old and make great apartment dogs due to their small size. They typically do not like the outdoors and hate the cold which accounts for their tendency to shiver. A sweater is usually a welcome gift and is well tolerated on cooler days. Many people carry them but it is a good idea to let them walk to keep fit with several 15-20 minutes walks a day enough to maintain general fitness. It is generally better to use a harness instead of a collar when walking to prevent choking and throat injuries because of their delicate bone structure. An affectionate dog, they love to snuggle, make good watchdogs and are safe around children provided they are not teased. They are also relatively cheap to own because they obviously don't eat as much food as a larger dog. Chihuahuas are born with a soft spot on the top of their head similar to a human that doesn’t always close so care must be taken to avoid serious bumps and repeated jumping down from a chair, bed or couch can cause stress injuries on leg joints so you might want to consider buying a pet ramp if you get a Chihuahua. There are two types of Chihuahuas that are identical except for coat length, the short-haired and the long-haired with the short-haired being the more popular as evidenced by all of the appearances in television and movies. The Chihuahua is the smallest breed of dog in the world and is named after the state of Chihuahua in Mexico, where it was discovered in 1850. Some scholars believe the Chihuahua to be descended from Chinese hairless dogs-who may have crossed over from Asia to Alaska on a land bridge before continental separation created the Bering Strait and bred with the ancient Techichi dog, creating the modern-day Chihuahua. But due to the lack of archaeological proof to support this theory, it was later believed that Chihuahuas were brought to Mexico by settlers from Spain. 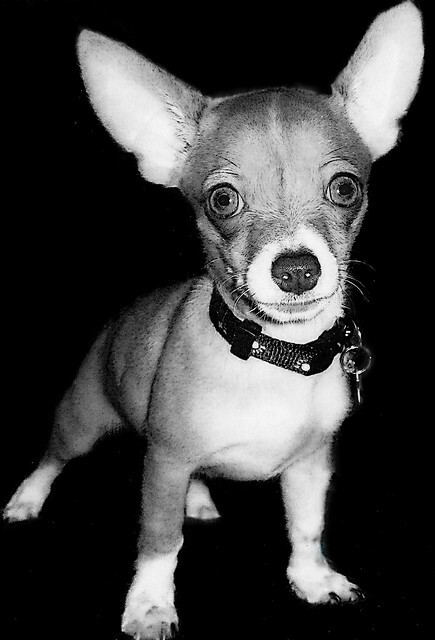 The American Kennel Club registered its first Chihuahua in 1905. There are two types of Chihuahua. One of which has a smooth, soft glossy coat, which covers the whole body except head and ears. The other version has a long coat with an undercoat. This type of coat could be curly or flat. The Chihuahua falls under the AKC's toy category. Generally their height is 6 to 10 inches at the shoulders and their weight is 2 to 6 pounds. Chihuahuas come in various colors, from plain white, to solid black and spotted, or other colors like silver, blue or gray, chocolate, fawn or tan, tricolor-chocolate, blue or black with tan or white markings, merle and brindle, and each of the colors vary in tone and shade. Chihuahuas are mostly known for their small body and large, sharp ears. A Chihuahua's nose is usually short and slightly pointed. They have lean jaws and cheeks and blue, mole or chocolate colored noses. However a pink nose is permissible in blonde Chihuahuas. The tail is either up or curled in a loop with the tip of it slightly touching the back. Many Chihuahua owners often are confused by the variety of dog foods available on the market. They often complain that their pets suffer from intestinal disorders, itching, dandruff, allergies etc. As a responsible Chihuahua owner, you should provide your pet with meals containing proteins, carbohydrates, vitamins, fatty acids and minerals. A proper balance of these components will not only keep the dog healthy and happy but it will also save you from the hassles and frustration of frequent vet visits and costs. Dry foods usually help to keep the dog's teeth clean and also, help to work his jaws. This kind of dog food is easily digestible. Aside from a few premium quality dog foods , you should avoid branded food items or commercial dog food. They contain preservatives, additives, artificial colors, non-nutritive residues, etc. and can adversely affect your dog's health. The chihuahua's diet also must contain vitamin and mineral supplements in balanced concentrations.You can safely give your Chihuahua a normal lamb and rice combination. This not only takes care of the nutritional needs of your Chihuahua, it reduces the risk of allergies and other health disorders. Due to lack of proper nutrition, Chihuahuas can suffer from vomiting, belching, loose stools, gassiness and stomach ache after meals. Some foods commonly enjoyed by humans are dangerous to Chihuahuas like, chocolate, grapes, raisins, onions, macadamia nuts, alcoholic beverages, salmon (sometimes triggers allergies), etc. Also, do not overfeed your Chihuahua. Obesity is dangerous. In order to give your Chihuahua a long, happy, healthy life, you need to be conscious about what you are feeding it. Chihuahuas are prized for their devotion, ferocity and personality. Their curious nature and small size make them easily adaptable to a variety of environments, including the city and small apartments. Chihuahuas are usually intelligent and independent by nature. 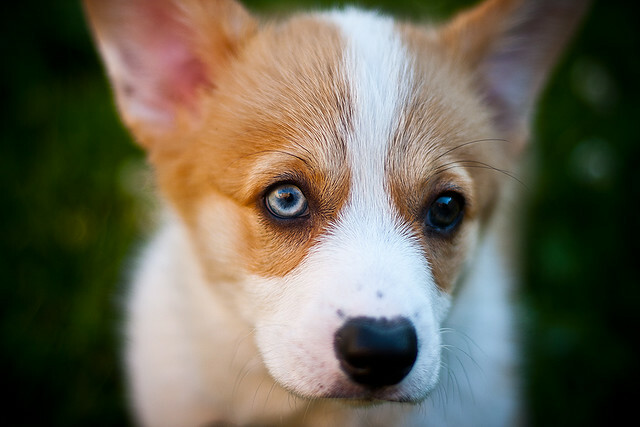 Some dogs are bright and can learn quickly, while others are more stubborn and obstinate. Some are outgoing and friendly towards strangers while others are withdrawn and aloof. Whatever your Chihuahua's attitude now, your love, care and training can change your dog completely, from an unruly, out-of-control dog to the best dog in the neighborhood. 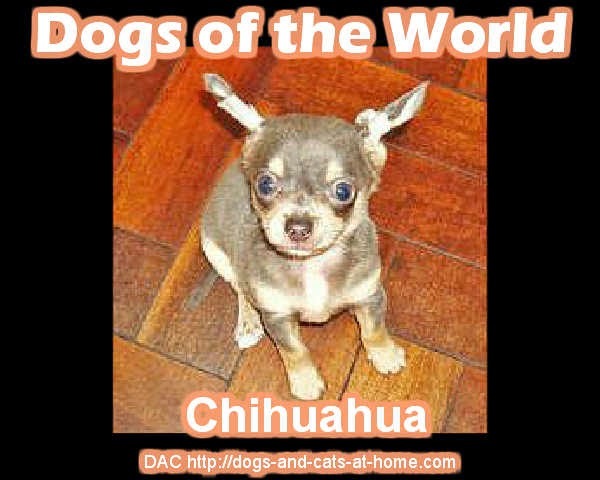 Chihuahuas, in general, are delightful characters, and are lively, entertaining, and very loyal. They crave for constant love and attention from you and your family members.Chihuahuas are not well-suited as small children's pets because of their size, temperament and tendency to bite when frightened. It is recommended that children be school aged or older before adding a Chihuahua to one's home. Also, many Chihuahuas focus their devotion on one person, becoming overly jealous of that person's human relationships. This can be nipped in the bud through proper socialization. Chihuahuas also tend to have a clannish nature, often preferring the companionship of other Chihuahuas over other breeds of dogs. Chihuahuas seem to have no concept of their own size and may fearlessly confront larger animals, which can result in injury. Chihuahuas get sick from parasites, viruses, bacteria, protozoa, and fungus. In some cases, these diseases and infestations are fatal unless caught early and treated. Sometimes they sow the seeds of death or debilitation years down the road by causing chronic illness or damaging organs. Fortunately, veterinary researchers have developed drugs and treatments that reduce the occurrence and effects of many diseases and parasites, but they do not eradicate the diseases, they only hold them at bay. Immunizing Chihuahuas against disease is a simple process. Pet owners may even take vaccinations for granted. It is the most routine procedure performed in veterinary clinics. The major viral diseases are rabies, distemper, parvovirus, hepatitis, parainfluenza, and coronavirus. The major bacterial diseases are lyme, leptospirosis, and kennel cough. Diseases like Rabies, Lyme, and Leptospirosis can also infect people. Chihuahuas can also get sick from debilitating diseases like arthritis and hip dysplasia but are most common in older Chihuahuas. Chihuahuas are also very susceptible to hypoglycemia and diabetes. Before trying any treatment options, you should get an accurate diagnosis of your Chihuahua, which is usually done by a physical examination combined with x-rays performed at your veterinarian's. Treatment and prevention are personal choices but involve several options when considering your Chihuahua's health. You can either go for modern day medicines or homeopathic treatments. Proper Chihuahua health care also involves grooming. You will often notice many Chihuahuas with dirty, rough or greasy hair, their nails too long, teary eyes, and dirty ears. Obviously, these Chihuahuas are not well-groomed. 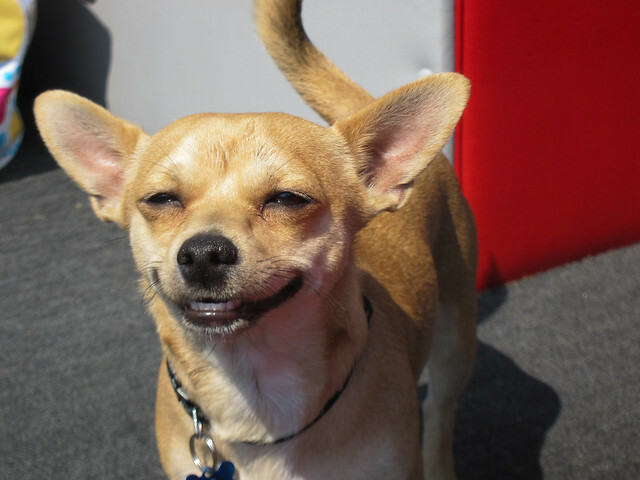 Remember, a well-groomed Chihuahua not only looks good, but he feels good from within as well. This paves the way for better health for your Chihuahua. Incredibly enough after grooming, chihuahuas can look very different and seem to have more pep. Ticks, fleas, manges and other parasites often breed on a Chihuahuas coat. With regular grooming you can avoid this. Physical exercise is important for your Chihuahua. Puppies, adolescent, healthy adults, and senior pets alike need lots of regular daily workout sessions to maintain their health. The type of exercise depends on the age and fitness of your Chihuahua and your own lifestyle. Chihuahuas are adaptable and are happy to play Frisbee in the park or take long walks in the neighborhood. Daily exercise is recommended unless the weather is especially dangerous or a medical problem limits your Chihuahua's activity. If there is a medical problem, consult your veterinarian about exercise limitations. Keep in mind that obese Chihuahuas and those with heart and lung diseases may have a problem, and be sure to consult your vet before starting a new regime. You know your pet best and can often notice subtle early warning signs of illness that someone else may not detect. If you observe symptoms or other signs that worry you, call your veterinary immediately. 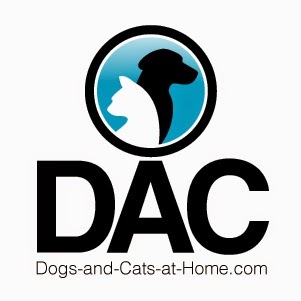 The safest approach would be to have your pet examined before it is too late. Although figures often vary, as with any breed, the average lifespan for a Chihuahua is approximately 8 to 18 years of age. Although an owner needs to take great care of a Chihuahua it will be your best friend and faithful companion for their life. And will give the owner great joy if taken care of properly.